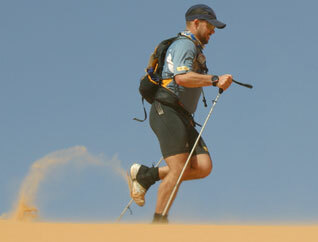 The Marathon des Sables is the original desert foot race and is now in its 34th year. Covering approximately 230km in the Moroccan desert, each participant must carry his or her own rucksack containing food, sleeping bag and clothes. Participants enter as individuals or in teams of three and this year about 1,300 runners will be competing. For the Marathon des Sables, as with all desert ultra marathons, a balance needs to be struck. Running in the heat of the day, one wants the lightest load possible. On cold desert nights one wants to rest and sleep well. Desert nights can drop to a chilly 4°C, air frost temperature. The PHD Desert Race Collection of Desert Race bags has been designed specifically for desert racing. The Collection contains four bags, all made in 7X fabric (our lightest), and, thanks to their innovative construction, all the lightest of their type. † Our unique Triobag has a down-filled middle layer inside for temperature control. It can be used in 3 configurations for -2°C, +8°C and +15°C. The Desert Race Collection also includes a Half Bag and Down Top to be used in combination as a Sleep System. The Desert Race Pullover provides warmth around camp in the evenings and for those chilly pre-race mornings, and the Desert Race Half Bag provides warmth for the legs and feet during sleep. This setup creates a very flexible system. * +3°C for sleeping in. Typical Operating Temperature when wearing during the day (when your movement / metabolism creates more heat than at night) is -5°C. TEMPERATURE RATING: Put simply these are the temperatures at which you should be able to get a night's sleep in normal circumstances. For fuller details about the TOT rating see this Technical Briefing. LINERS: A liner will add to the insulation if you choose the Minimus K or the Ultra K, but want more warmth. As always it is a trade-off between the extra weight and bulk and the warmth you gain (maybe 2C). Silk liners at 140gm probably give the best value. FABRIC OPTIONS: The K Series sleeping bags come with MX outer fabric as standard. Ultrashell is an optional outer for these two bags. Ultrashell is highly wind/water resistant and adds about 18gm to the total weight. ZIPS: The Desert Race bag come with the option of a footzip, which adds 10g and allows some air circulation around the feet. Zips are an option on the Minim bags, but most competitors don't ask for one. A short zip with draft tube adds about 55gm (2oz): a full zip and tube adds about 120gm (4oz). Zips also add to the packed size. Also available is our Desert Race Stuff Sac, equipped with multiple lashing points and formed into a slender shape to allow easy attachment to the outside of a full rucksack. Our WaferLite clothing is especially suitable for desert racing. At 130g for the Jacket, 125g for the Shirt and just 77g for the Vest, these are the lightest down tops in the world. Nevertheless, they provide insulation when the temperatures drop to 5°C, which is roughly what you can expect in the evenings and mornings. They can also add a useful performance boost to your sleeping bag on colder nights. The next Marathon des Sables starts on 5th April 2019.